It’s that time again for monthly favorites! I didn’t try out much new products because it was kind of a hectic month. I graduated, I went cat-sitting for my uncle and aunt, I had to take care of some paper work and I am looking for a job now. So not to much time to buy new stuff. 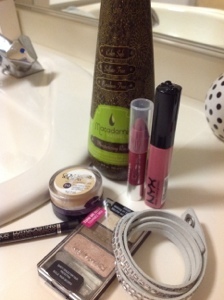 Although I did buy one thing this month that made my favorites, and that is the Macadamia Moisturizing Rinse. It is a daily conditioner, you put it on after you used your shampoo and after a minute you rinse it out. It makes your hair so smooth and easy to brush, which is ideal for me because I have really tangled hair after washing it. I also have 2 lip favorites. When I don’t want to use a bold lip color I reach for my Nyx lipgloss in beige. It is just the perfect neutral color. Another favorite is the Clinique chubby stick in Super Strawberry. It is a slightly darker color, but it still is pretty neutral. I love the consistency of the chubby stick, it is moisturizing, it doesn’t dry out your lips and it has a good color payoff. For the eyes I have also 2 favorites, well actually 3, but the third one is the Covergirl under-eye concealer. It’s ideal to cover up dark circles. And the best thing is that it is moisturizing. I personally think it is important to moisturize the under-eye area, because it is a very delicate area that needs a good treatment. This month I used a lot of neutral eye make-up and for that I used my Wet’n’wild trio in Walking on Eggshells. This trio is ideal for a quick neutral look. And the last eye products is the Catrice Longlasting eye liner in black. Despite it is not a waterproof liner, it does stay on all day. I also use it when I go swimming, and even then it stays on. My last favorite is the grey Swarovski wrap bracelet I got as a present for the cat-sitting. A wrap bracelet was on my wishlist, but I didn’t really found one that could go with a lot of outfits, but this one surely does because I already wore it a lot. What were your favorites during September? This entry was posted in beauty, fashion, monthly favorites and tagged Catrice, clinique, covergirl, macademia, monthly favorites, nyx, september favorites, swarovski, wet n wild by missnathaliexo. Bookmark the permalink.